Scottish brewer Innis & Gunn is under fire for its claims that using pieces of oak barrels to flavour its beer counts as ‘barrel-ageing’. The news flared after a press release sent out by the brewery yesterday (17 October) in which, as well as a new look for its core range, Innis & Gunn explained its new, “unique Innis & Gunn ‘barrel into beer’ method”. Apparently developed for its core range by founder and master brewer Dougal Gunn Sharp, the technique involves cutting up the staves of rum and bourbon barrels, toasting the pieces and adding them back to the beer for five to 10 days while it’s in the tank. The brewery hailed the process as a return to all of its beers being ‘barrel-aged’. 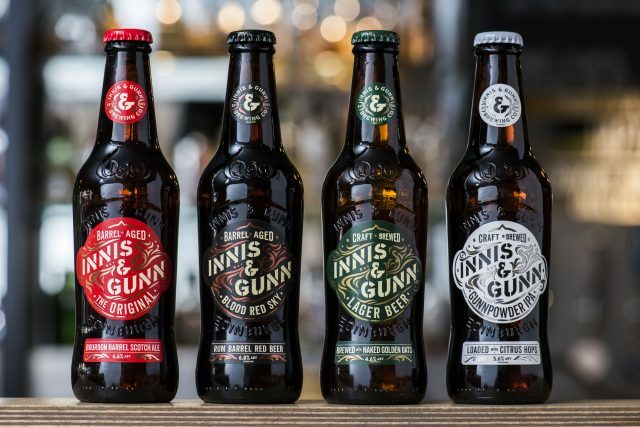 Seven years ago a shortage of barrels meant that Innis & Gunn had to change the process and refer to its beers as oak-aged instead – with wood chips being the means by which flavouring was achieved. The ‘new’ beer into barrel technique is apparently the result of experimentation over the last seven years. The crucial difference Innis & Gunn seems to make between simply using chips or staves and its own method is that the wood it uses has come from what used to be barrels. As such, Innis & Gunn is standing by its claim that the resulting beers can be called ‘barrel-aged’ rather than ‘oak-aged’. A report in The Morning Advertiser, however, has seen commentators and other breweries pour cold water on the idea saying that adding bits of old barrel to impart flavour to a beer was not the same as ageing a beer in a whole barrel. Responding to these criticisms, Sharp said: “We have replaced oak chips with bourbon barrel or Jamaican rum barrel pieces which returns our core range of beers back to being 100% barrel-aged. This is an unconventional method that turns the traditional process on its head to create more consistent barrel-aged beer without losing any of the rich depth of flavour. “While this is not the traditional use of barrels, we are being clear about how we make our beers by putting the ‘barrel into the beer’. This detail can be found on our packaging and on our website. “Our roots are in barrel-ageing, a challenging process for craft brewers, but also the most rewarding. It is no different whether we use our new ‘barrel into beer’ technique, or the traditional beer into barrel method which we’ve been using for fifteen years on our limited-edition beers. The process of flavouring wines with wood chips or staves (generally to quickly impart an oaky/vanilla/coconut note) is allowed in the wine industry, and is used predominantly for more entry-level wines as it is cheaper than ageing in expensive new barrels, but wines that use the technique are not allowed to say that the final wine is ‘barrel-aged’, usually using soft euphemisms such as ‘oak-influenced’ or oak’ flavoured’ instead. There are no (or extremely few) AOC/DOC produced wines anywhere in the world which are allowed to substitute barrels with chips or staves in their ageing process. This is because the premise of putting a wine, brandy or beer in wooden casks of any size is not not just about extracting flavour from the cask but the effect of oxygen on the liquid inside the cask and its contribution to both the ageing and gustative effects on that product. It would seem however that no such regulation applies to beer. The Campaign for Real Ale (CAMRA) has no such definition as it is a process that is not (typically) used in the brewing of real ale. The Morning Advertiser also asked the Trading Standards Authority if the claims were misleading but were apparently told no standard industry definition exists. Over in the US, meanwhile, the Craft Beer Association is quite clear that using oak chips does count as barrel-ageing. It states: “A wood- or barrel-aged beer is any lager, ale or hybrid beer, either a traditional style or a unique experimental beer, that has been aged for a period of time in a wooden barrel or in contact with wood. Does Innis & Gunn’s process count as barrel-aged? Is it potentially misleading? Should there be an official definition of barrel ageing in the beer industry? Let us know in the comments below. Barrel ageing means just that, putting the product, beer in this case,into a barrel and ageing it. It must be remembered what barrel ageing actually does: It lets “the product” beer in this case but it would be the same if it was wine, brandy etc., exchange with oxygen through the wood and also allows an exchange of tannins from the wood into the beer. If wood chips are put into the liquid then the process is definitely not the same. The Innis & Gunn statement is definetly VERY misleading. We must also consider that the purchaser of the beer will not have the technical knowledge to evaluate the statement and come to an informed decision. This is yet another example of savvy marketing people trying to bend the truth to their advantage and confuse the purchaser into thinking that the product in question is premium. I for one am glad they used barrel aged on the label. I remember the first time being introduced to Innis and Gunn at the Grand Floridian’s Narcoosse at Wait Disney. Walt Disney is the only place I can get it. Being from Texas, it is not distributed to any of our retail stores. One of the many things i look forward to when visiting is a pint of I&G. I most likely would have passed on trying it that night had there been a different label. Wording is debatable, but the taste is not. It’s Good! They have it at several liquor stores in Conroe, TX. Look up the spec’s if you are close. They have it at the spec’s in Conroe, TX.